Spiral staircases are certainly nothing new but fabricating an enormous one in solid surface with compound angles, well that is new. And that’s exactly the project that renowned architectural firm Payette had in mind for an atrium in the building that would connect both 75 and 125 Binney Street, in the heart of Boston, that when completed would be the home of Ariad Pharmaceuticals. 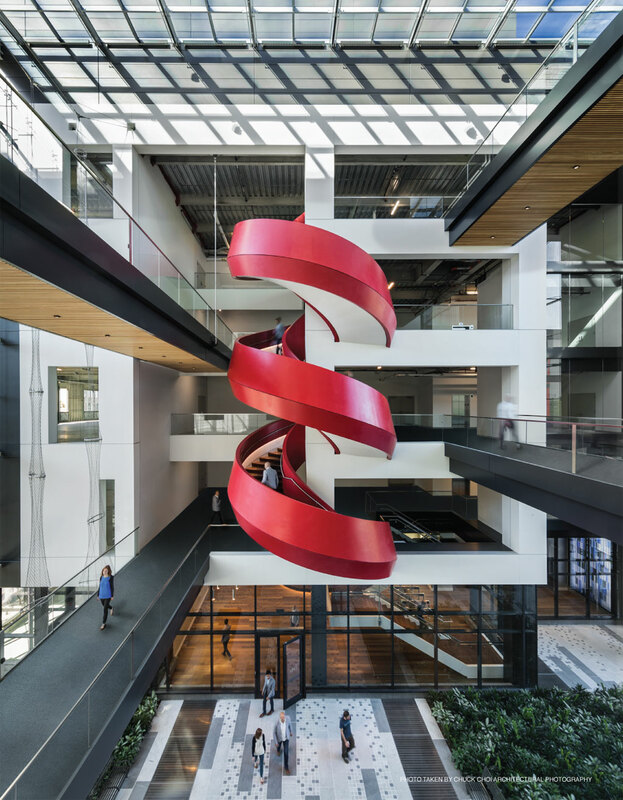 The design for the monumental stairs was inspired by the red spiraling spool of thread depicted in the Ariad Pharmaceuticals logo. However, the design was highly complex with two surface planes meeting along a rising curve (see Figure 1). The difficulty of fabricating the project was nearly as massive as the project itself, so much so that most fabricators wouldn’t even attempt it. However, Payette already knew a company that would be likely to take on the challenge. Payette was no stranger to complex projects. Although it is based in Boston, it has completed advanced architectural projects around the world. dedication to beauty to a new class of projects. Today, the practice has advanced as an international architectural thought leader, providing planning and design services to leading institutions across the country and abroad. And it is that reputation that led to Payette being selected to work on this project. Similarly, the high regard that fabrication company ASST, based in south central Pennsylvania, was held in based on the positive outcome of the previous work it had performed with Payette, was the motivating factor to bringing the fabricator onboard for this difficult project. ASST had previously worked with Payette on the Penn State Hershey Children’s Hospital and so the architect was familiar with the well-developed thermoforming capabilities ASST possessed. While other fabricators were invited to bid on the project, ultimately it didn’t necessarily come down to price, but rather ASST was selected because of its thermoforming experience and clean safety record combined with its ability to provide an adequate bonding on a large complicated project such as this to reduce owner and general contractor risk. So who was this fabricator daring enough to take on such a difficult project? If you ask anyone familiar with ASST, they likely won’t be surprised that the company stepped up to the plate. 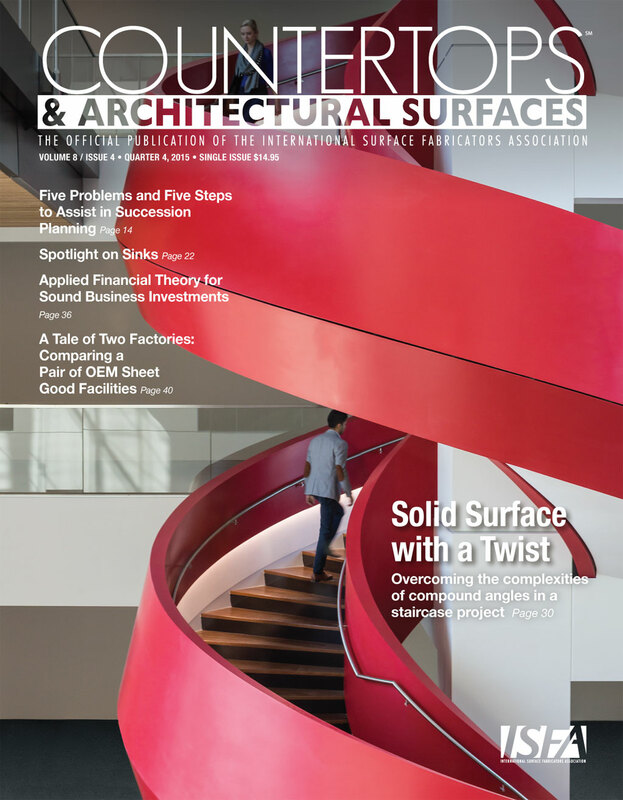 ASST is an award-winning specialty surfaces fabricator and manufacturer. As an industry leader, it specializes in complex fabrications and complete Division 6 millwork and casework solutions for the healthcare industry. However, its work spans a variety of markets beyond healthcare, such as the education, retail and corporate/public space arenas. Known for its innovative (and patented) thermoforming technologies and product designs, ASST takes on project challenges others avoid. It brings to the table a passion for excellence — to go beyond and to build what some initially thought was impossible. Since its founding in 1998, ASST has developed an impressive portfolio of successfully completed projects with high-profile contractors, architects, interior designers and end users. The company’s headquarters encompass 52,000 sq. ft. and includes both offices and fabrication facilities, including a very large thermoforming workshop. Among the equipment at the disposal of the 31 employees of the company are three thermoforming ovens and two vacuum tables, as well as a 60-ton proprietary press and a vacuum press related to patented ASST technologies. It also has three CNC machines: one 5-axis KOMO CNC machine, one 3-axis KOMO CNC machine and one 3-axis Heian CNC machine. For cutting parts the company also has a Schelling panel saw. The shop is set up into typical “line work” areas for more common flat fabrication work, but also has various open workshop areas for custom projects. It seems ASST was custom-made for this highly custom project. But once they had been selected for the work, the venture had to be realized. 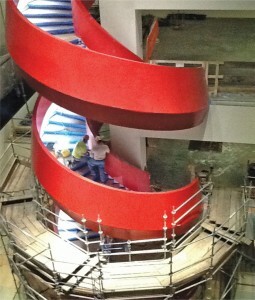 The architectural team underwent many design variations, but the main design intent was for the stair to appear to be fabricated from continuous solid surface. The Porcelanosa Group’s Krion solid surface material, a relative newcomer to the U.S. solid surface market, was chosen by the architects because of its excellent thermoforming capabilities. According to the manufacturer, Krion is a “new generation of solid surface” and has a unique proprietary blend of approximately 75 percent ATH to 25 percent resin. This makes the material easier to thermoform, according to the company, and also best ensures color consistency throughout each sheet. Of course, each manufacturer touts a variety of properties that make it stand out from the rest, but as we all know, beauty (or in this case thermoformability) is in the eye of the beholder. 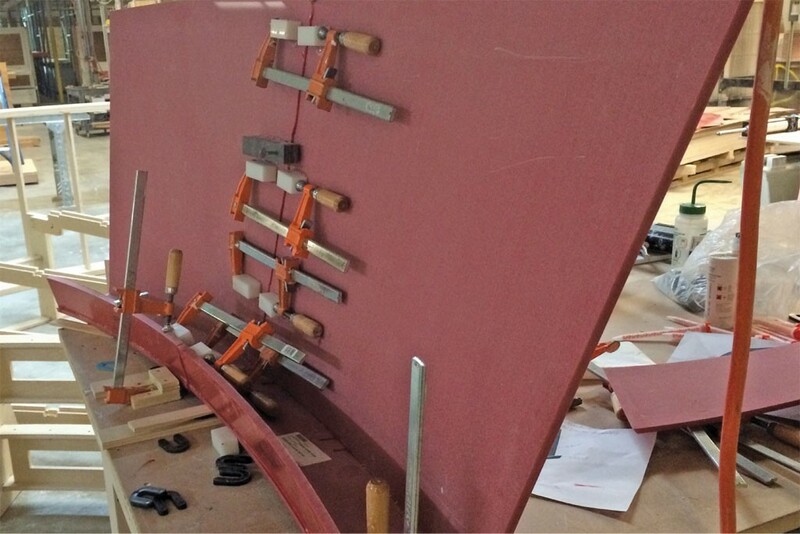 One of the main complexities of the project, beyond its size, was a result of the stairs having two curved and rising surface planes with cut angles that, by nature, constantly changed as the material pieces were routed to the correct dimensions. So, before any actual fabrication work could be done, modeling was required. 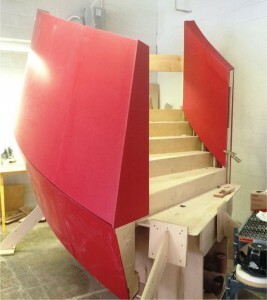 Once an initial design was put together, a mockup of one landing was built in the ASST shop to verify the geometry (see Figure 2). Once it was created, the design could then be tweaked according to the architects input, with regard to the lighting and tread termination locations, etc. To improve the flow of information between the fabricators and architect, a co-location work arrangement was established on-site in Boston to speed up the final design process and to improve communication among team members. With everyone working in one location for two weeks, design revisions were realized faster and coordinated across disciplines (see Figure 3). The group utilized 3-D modeling extensively when it came to determining the aspects of the steel substructure, built by DeAngelis Iron Work, for the plywood support ribs (see Figure 4). When all was said and done, 80 hours of design work were required. Then came the 2,000 hours of fabrication, which included 196 hours of CNC programming and run-time on the 5-axis KOMO machine. And once all of the parts were fabricated, glued up and sanded, the panels were numbered, labeled and prepared for shipping to the site in Boston for assembly. Unfortunately, though, this wasn’t the end of the challenges involved in the project. As is the case with Northeastern winters, Boston was hit by weekly blizzards during installation. The extreme cold temperatures delayed the schedule by four weeks, and Boston officials even declared a state of emergency at one point with mandatory traffic shutdowns preventing deliveries to the site. In spite of the challenges and compressed schedule, in the end 215 sheets of ½-in.-thick Krion solid surface in “Fire Red” and “Snow White” were installed using z-clips and the project was completed (see Figure 5). The final result is nothing short of an amazing accomplishment for all involved, and is another spectacular project for Payette and ASST to proudly hang their hats on. The author would like to offer special thanks to Payette’s Gordon Grisinger and Hillary Barlow for their design vision, steel fabricator DeAngelis Iron Work and ASST’s team (in no particular order): Nick Buckley, Josh Cowden, Brian Magness, Bob Hannigan, Mike Henry, Jared Shearer, John Sulc and the entire ASST production team. Andrew Dreves, ASID, is the director of marketing and Products Workshop for ASST, 350 South St., McSherrystown, PA 17344; www.asst.com. He is responsible for strategic business development, marketing, branding and product design initiatives for the company and can be reached by email at andrewdreves@asst.com or by phone at (717) 630-1251 ext. 305.